I have now finished the creation of actual features in the game, and I hope that I’m done with tuning/removing debug items, because I don’t think I am going to check any more. I have implemented all of the features specified in a previous post. The final release on GitHub is here. I’ve lost motivation and interest completely for the non-mandatory side of this assignment, soooooooo that’s embarrassing. I don’t know if I’ll ever run on a sudden desire to use Python in a few years: if I do then I may turn this base-assignment into a fun extradite game, but for now I’m making inventory and battle and victory and that is it. The reason why is partly real life circumstances, and the rest has to do with me feeling too inspired with my long-term dream for me to want to develop this small idea; perhaps this makes me less reliable with my project commitment, but most of my blog content is theory and design, and that is unchanged whether or not I give up. This, however, leads to a problem, in that I indeed need some kind of character growth implemented in-game; the first thing that comes to mind is to implement a kind of grinding that deliberately and exclusively holds complicated gameplay back from new players. Fame would affect the amount of followers you can keep, holding back the complexity of optimizing multiple characters, allowing you to practice and master the usage of 3 followers before you start playing with 4, or say, the usage of a new class without any followers before you start playing with a follower. And with this I add that my aim is to make less of an RPG ‘idler’/’infinigrind’ (new term!) and more of an RPG puzzler, relying on stealth and choices to take out enemies in a non-direct way, all in a quasi-medieval age of civilization. There will be more than one system determining your maximum party size, however the raw grinding aspect is the one that both gives the complexity to players who fail to prove experience more efficiently, and that allows players easier victory when struggling, as well as satisfying the criterion of the assignment! This setting opens up three primary linked stories, and to an extent you will need to participate in all three, but which ones you thrive in are up to you, and your character preferences. 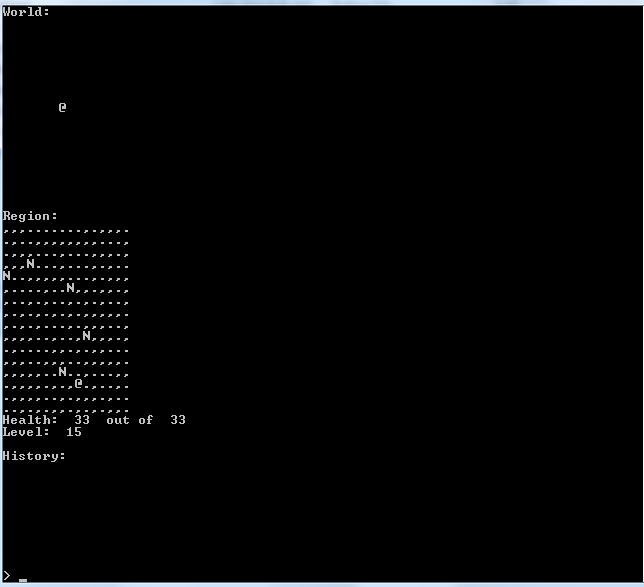 The text interface is the input and output for the game, whereas the area map is just an auxiliary to this. The world map simply names the different regions as they appear geographically, and although the game could be enjoyable with personal memorization of maps, (Minecraft!) I have a marked criterion to meet, so that is what I shall be exploring: map integration in a geographically driven survival/exploration/adventure game. I’m not going to use the geometry system for actual controls; there shall be no “move (1,1)”, no “move left” and definitely not any “goto (547.8, 38664.2)”. I recently started actually working on a programming project which is designed to be a Harvest Moon clone. It is going to run without any interface, and this will be the case indefinitely. Some day, when I get better at C++ graphics, I shall bother with that, but if I want to work on graphics I’ll just work on my tactics project. I don’t exactly know how the project is going to go, I’ll just work on it as I wish alongside the other two projects, and try to learn something. Since I am a programmer, and also since open source is amazing, I am now using GitHub for my source. I have a repository for both of my projects, and some other ones as well; you can look at any / all of them here. The more interest my blogs receive, the more I will maintain activity and interest when communicating updates, obviously. Now you can finally see my actual work; design ideas posted on the blog will also make their way to the repos. Arrange the dimensions of the container in descending order, have a biggest, middle and smallest. Do the same for the object being fitted. if any of the three object dimensions are greater than their respective container dimension, the object doesn’t fit. Then it performs a check which is equivalent to the usual “size” attribute check, using the volume of the object and the volume of all other objects and the liquid capacity of the container to check the plausibility of the object fitting. If both checks succeed then the object fits fine. This system isn’t quite perfect, but it is very good. Of course not all objects are a simple cubic three dimensions, so three dimensions must be chosen that encompass the object for the sake of the algorithm, although most objects will have square or circular bases (buckets, sticks, kitchenware) and the latter can simply be translated to the former. The empty space that is ‘wasted’ in this process by rounding circles up into square objects compensates very well for the fact that some situations are completely impossible but pass both tests anyway. In other words, since there is no actual tetris involved in the storage process, there is a space penalty. Now in terms of benefits, this system provides variety, in fact, this system can create gameplay by providing situations in which the size of containers needs to make you think about how you are going to sort your possessions to deal with them. Now all I need to do is think of something to make that a good thing, and not just completely annoying.